"Let one of you be the learner. Learn the shape and the direction of strength. Tithe both sides of your blade to me." 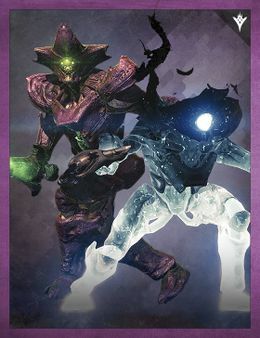 Mengoor is a Hive Knight that appears as a boss in the Court of Oryx. She is accompanied by her comrade Cra'adug. Both Knights posse an invincible shield that is only nullified when they are in close proximity to each other. The Books of Sorrow briefly describe them as being partially responsible for the extermination of the Taishibethi species, standing upon the Raven Bridge and killing Taishibethi for a decade. At the Golden Amputation they were punished for tithing their kills to one another and not Oryx. Mengoor is the second known female Hive Knight after Xivu Arath. She is described as "sterile" by Oryx, an adjective commonly applied to female organisms.